Epic Rock Songs of the 70's! In 1965, Bob Dylan released "Like a Rolling Stone" as a single. It was a #2 billboard hit, and the first song longer than 6 minutes to reach that level of the top 40 chart. It was a true turning point for rock music. It broke down the door for recording artists, and made the record industry realize that song length really wasn't as big a deal as previously believed. Long songs became more common over the next few years, and by the time the 70's were in full swing, it seemed almost every big-name rock band had an 'epic' rock-song hit. The most memorable of these long rock songs has to be Led Zeppelin's "Stairway to Heaven". I've talked with some people from my parents' generation about this song, and without fail, they say how it dominated the airwaves seemingly forever. The song has permanently attached itself to the early 70's era, and is one of the most intricate, and expertly crafted hard-rock songs of all-time. It's a cultural phenomenon within itself. Remember the scene from the movie Wayne's World, where the guitar-shop owner stopped Wayne from playing the opening notes of "Stairway" because a sign in the store declared: "No Stairway to Heaven"? Don't forget my mentioning the compilation CD, "Stairways to Heaven" from my previous Led Zep post: a collection of different interpretations of the classic song. To be a rock and not to roll." Happy St. Patrick's Day! For this special occasion I'll review Green Day. Green Day are a neo-punk band that jumped onto the scene in the mid-90's and fell under the over-used blanket category of "alternative". Their songs are short fast & fun and often poke fun at a variety of social & political issues. Each Green Day album was pretty much a repeat of the previous with minimal variety... until 2004's(?) American Idiot! American Idiot was a concept album and a true masterpiece among modern hard-rock music. The first time I listened to it I recall thinking, "This is the best Green Day song ever.... no THIS is the best Green Day song ever!" over and over again as one song followed the next. I'm also pretty fond of the anti-Bush political commentary that's sprinkled throughout the lyrics. Listening to Green Day on St. Patrick's day is a mild tradition for me. During my college days I used to wait until March 17th to go out and collect the next Green Day album. So if you feel like "going Green" on the one day of the year when everyone is Irish, give Green Day a listen. 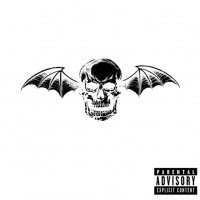 What better way to kick off the 7th month of my blog than by reviewing Avenged Sevenfold? When Spring came around I received Ozzfest tickets for my birthday, and A7X were on the bill. 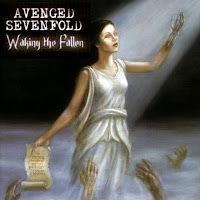 I had already found their City of Evil CD, and now made a point to go collect Waking the Fallen as well. 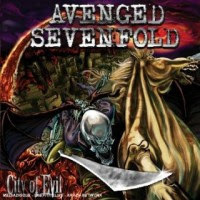 I gave both these CDs plenty of listens before attending Ozzfest, and must admit I like City of Evil much better. 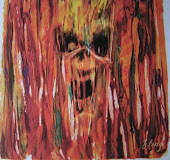 At Ozzfest, this was the album they played the most songs from, and their stage show was very cool also. Their logo (a skull with bat-wings) was set as the backdrop with red glowing eyes. During their final number, the wings began to flap and the skull rose high in the air, spewing smoke from the mouth.